I said I wasn’t going to go to Basel. It was pointless. I would be doing it for the sake of it sounding cool. 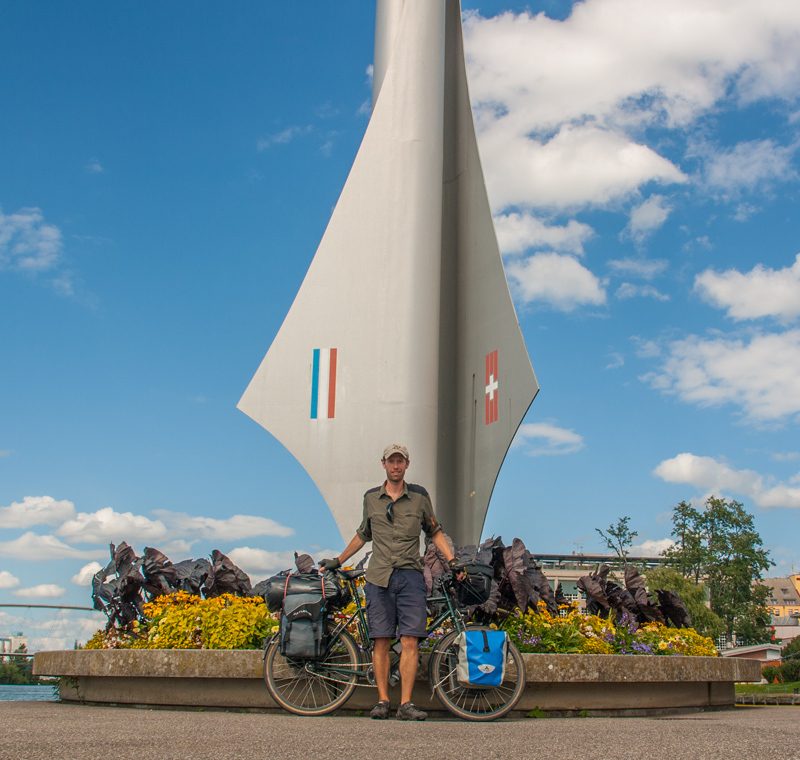 I had been to that spot where France, Germany and Switzerland all meet before. It was 1992 and our last family holiday, mountain biking in the French Alps. Included in that holiday was a trip to Alpe d’Huez and myself and brother cycled up it on our mountain bikes, pretending we were in le Tour de France. I’ve loved cycling a long time! It was the memory of that trip in mind as I decided to continue the extra few hours to Basel for a photo. It was good to placate my emotional self with a feel good act. It needed a cuddle. As all long trips have a habit, things had started to go wrong. Gone were the feelings of novelty and pure excitement that what I was going today was ride my bike. Following a river from its mouth for well over a thousand kilometres really gets to show you how we use rivers. In the Netherlands and the northern part of Germany to near Cologne it was all farmland, crops and lots of container ships going up and down. Then nearing Cologne it gets very industrialised with big coal power stations, natural/liquid gas plants, petrochemical, etc. Once you are south of Bonn it turns into a picture postcard with steeply wooded banks and castles overlooking the river from atop the hills. Lots and lots of pretty old villages with a few vineyards thrown in for good measure. The last section in southern Germany was scenic countryside with the odd (turned off) nuclear power station thrown in! At the end it was a bit of a slog through the mosquito ridden southern forests of Germany. The weather had turned, it wasn’t warm but there were mosquitoes everywhere and they wanted their lunch. It was only a matter of time until I got pissed with something. There was always a honeymoon period to begin with, it lasted just about bang on a month. The trigger could have been the weather, the mosquitoes, tiredness, sickness or combination of things. The straw that broke the camel’s back was feeding coins into the wrong washing machine. This led to a meltdown, doubly so when the office was closed for two hours before I could do anything about it. Pathetic really but my emotions ran riot over me and I had a bit of a meltdown. I guess little things going wrong have added up and got to me. Threaded gas canisters, broken mudguard, ripped flysheet, wet feet, cold hands, being tired, not being able to communicate more than a few words. That last one is the key, most things are surmountable as people will help, but you need to be able to tell them what is wrong. I started to dread approaching someone or starting a conversation as it will be awkward and last a few words as the English spoken by most Germans I’ve met is like meine Deutsch, nicht sehr gut. This is why I must try and learn Spanish as best as possible to have a chance of making it through South America. The people are what get you through so I need to be able to communicate and have a conversation. I feel guilty complaining, as I edit my photos I see a dream, a dream I had and there is the evidence I am living it. To have the chance to do this, to live it out is a privilege. I live like I have no home, seeking shelter when the weather turns. Watching the clouds, trying to second guess the weather, a pretty demoralising sport. Waiting until near dark to find a quiet corner of a field to pitch my tent and await the dawn of a new day. Of course I do this all by choice, I could seek out a campsite and pay my ten euro or whatever for nothing much more than access to drinking water and a piece of grass. It seems such a waste and more than doubles my daily expenditure when I do. Days are spent thinking of the three things I do actually need, shelter, water and food. The rest comes and goes. Shelter comes in many forms, the site of a disused building on the cycle track with an overhanging roof is met with a smile and pure joy if there is a bench to sit upon. Water is simple where there are people and in over a month, refused only the once, in a Turkish kebab shop on a Sunday when all was closed. As for food, sometimes it feels like this is a tour of the branches of Aldi and Lidl across Germany with the odd Penny thrown in and it is a pure luxury to find a Kaufhaus, the choice! I got myself back on track by having an unscheduled rest. To do this I ended up having one of my hardest days, cycling in the pouring rain, and hailstones at one point, watching the numbers tick over. Head down as the trucks barrelled past me sucking me with the back draft and soaking me further with their spray. I hate doing this but it was the lesser of two evils, Campsite Paradiso was the other. I wanted to get to Kehl where across the river was Strasbourg. I had decided a day’s sightseeing and relaxing was what i needed. It turns out I got to meet, albeit briefly, another warmshowers.org host, Cathy, for a beer and our brief chat lifted my spirits. She had cycled in South America and being French helped me get some maps for here and plan a slightly different route. The next day I was good to go again. Now I’m in France and heading south west for Spain, this is another stage of my education. Cycling the cycle route along the Rhine was easy (that was the point), it was signposted, there were loads of campsites, supermarkets, whatever I wanted pretty much when I wanted, the weather was until the end, great. Turns out there are hills in France! I don’t think I’ve been on the flat yet, it’s all rolling up and down and so far a reasonably busy road, long gone are my traffic free cycle paths. Oh and being France, everything is shut at lunchtime and the campsite I’m in has prioritised a swimming pool over providing toilet paper. I guess then, I’m off for a swim. not going inthe swimming pool after you then! haha, decided against a swim in the end John! wow, what am amazing comment Jules! Truth is I have no more courage or self-confidence than you or anyone else. I just stopped worrying about the future. If I spoke Latin I might say Carpe Diem….